Hero of the Soviet Union Magomet Gadzhiev once said that a ship's commanding officer needs skills in search, mastery in selection of optimal moment and direction for torpedo attack plus impassive soldierlike boldness. Commander "should be the most imperturbable of the most passionless sailors, must have vivid imagination of romanticist and undimmed intelligence of professional, moderation and patience of genuine fisherman, skilful pathfinder, and adventurous hunter..."
Perhaps, these words said by the famed submariner many years ago are still in action. For a naval serviceman, there is no more reliable, comprehensive, and effective test of his professional and moral qualities in peacetime than maneuvers, exercises, and combat drills at sea. And all cruises are preceded by thorough onshore trainings, multiple fire drills upon simulated targets both indoors and on a ship's combat stations. Combat training of Russian Navy is conducted under a concept unified with operational and mobilization activities, joint support of Navy's assets, and in accordance with approved plans and trends corresponding to operational purpose of naval forces. 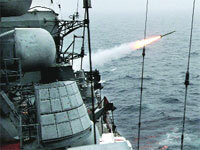 Generally, Russian Navy is ready to perform all given tasks. Prime criterions used to determine leaders in combat trainings are qualitative and accident-free accomplishment of combat training missions and high naval skills of personnel. Nowadays, qualification level of a crew and Russian Navy in general primarily depends on people, i.e. whether they are ready to perform a particular task. Permanent combat readiness is a long-term and hard work of entire crew, but it can be broken by a single neglect. Each member contributes to a crew's leading, but a commanding officer' role is most significant. What is the main thing in commander's activity? It is high combat readiness of his ship. Any commander of a present-day surface ship or a submarine should understand that readiness is not a one-time achievement. Whenever commander even slightly relaxes his attention to any single component of the service, this will inevitably cause recession of combat readiness in general. One manual on naval tactics said that "high combat readiness of a ship means such state of crew, arms, and equipment providing the ship with a capability to get instantly into action in an orderly manner and to accomplish all assigned missions in the most severe conditions". Here is what known marine novelist Leonid Sobolev wrote: "In sea battle where it's hard to demarcate defense from offense, firmness means the intention to strike an enemy's ship despite casualties, hull damages, fires, and arms breakdowns. When ship loses firmness of resistance, it becomes a vulnerable target. And conversely, when ship bares teeth to the bitter end, it can not only stay afloat but win the victory even over a superior enemy". Today all those words are still pertinent. To commander, the main thing is to keep crew and ship ready for battle at any moment. All crewmen should act properly and fast while encountering unexpectedness and changing over from one kind of combat activity to another, and successfully execute any decision of commander. It is necessary to keep in mind old naval rules: "Sailing for a day, be ready for a month", "No matter how good the weather is, be ready for a gale but not a breeze". Combat firmness of the crew is impossible without individual and collective skill to control damage and without well-trained interchangeability. It is also impracticable without moral and psychological stability of every single sailor and the crew in general. One should not forget it. Russian naval servicemen are actively engaged in combat training. For instance, Northern Fleet (NF) large ASW ship Severomorsk under command of Capt 1 rank Andrei Klimenko took part in the international naval exercise FRUKUS-2010 along with NATO warships and naval aviation. As a multinational task force deployed off the UK, mariners of the four countries practiced joint actions on humanitarian assistance while natural disasters. Russian Navy will continue to execute military diplomatic functions with the view to strengthen mutual confidence and understanding with foreign navies. This activity will be implemented as official calls at various ports to demonstrate Russian naval ensign – St. Andrew's flag. Much prominence is given to practical forms of cooperation. With this in view, a number of visits to foreign ports will be held along with bilateral naval exercises. Example, paying an official call at French port Brest in Sept 3-6, Northern Fleet nuclear-powered missile cruiser Petr Veliky attended the Russian-French naval exercise which included practice of helicopter landing on the partner's deck, transshipment, underway replenishment, and joint maneuvering. After visit to Tripoli (Libya), Black Sea Fleet frigate Ladny called at Italian port Taranto to attend a planning conference before joint Russian-Italian naval exercise IONIEX-2010. The exercise was held in Sept 6-10 to implement cooperation activities between the two navies, and improve interaction between Russian and Italian headquarters and warships. Black Sea Fleet (BSF) Guard missile cruiser Moskva had recently completed an official call at port Salalah (Sultanate of Oman) and continues sailing homeward to Sevastopol. 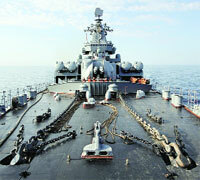 Sri-Lankan naval officers who had one-week training on board the Russian cruiser left the ship in Omani port. Summarizing the practice given to foreign officers, cruise commander Capt 1 rank Igor Smolyak highly appreciated the work done. "We tried to give our guests as much practical knowledge as possible in such short period. Special work plans and training materials were translated into English. Along with theoretic lessons, Sri-Lankan officers kept special navigational watches, familiarized with samples of Russian small arms, strengthened knowledge in international law aspect of a warship's activity. Such joint work was useful both for Russians and Lankan sailors", pointed out Igor Smolyak. NF large landing ship Admiral Levchenko continues to conduct anti-piracy mission in the Gulf of Aden and off the Horn of Africa. The ship had recently escorted another international convoy which consisted of ten civil vessels. Totally, there were 46 Russian crewmembers in the convoy. Northern Fleet conducted an exercise under general auspices of the fleet commander Vice Admiral Nikolai Maksimov. This was the summer training period's core activity. One of the major tasks was to practice interaction between various branches of the fleet and armed forces while conducting combined military operations. The exercise included several episodes like maneuvering, missile, torpedo, and artillery firings, search and "destroy" of submarines, landing operation, repel of aerial attacks etc. Apart from surface ships, submarines, aviation, and NF coastal troops, the exercise was attended by Army and Air Force components. Russian Navy was represented by BSF large landing ship Yamal at subsequent BLACKSEAFOR activation. During the sea phase such joint drills were conducted as tactical maneuvering, conducting of a surface battle, air defenses, and various forms of communication. Naval servicemen practiced interaction within multinational force on salvage of a distressed ship, sea isolation, inspection of a suspect vessel, and underway replenishment. Recently conducted large-scale exercise Vostok-2010 was another test of preparedness to active actions at sea in intensively changing situation, and checking of mobility and combat capabilities of post-reformed Russian Navy. About 30 warships and supply vessels, and over 20 aircrafts and helicopters were involved. Observing the exercise from NF heavy nuclear-powered missile cruiser Petr Veliky, the Russian president and Supreme Commander Dmitry Medvedev highly appreciated professionalism of naval servicemen. Thus and so, being one of the foreign policy tools Russian Navy as in old times continues reliable protection of our national interests at the vast of seas and oceans.